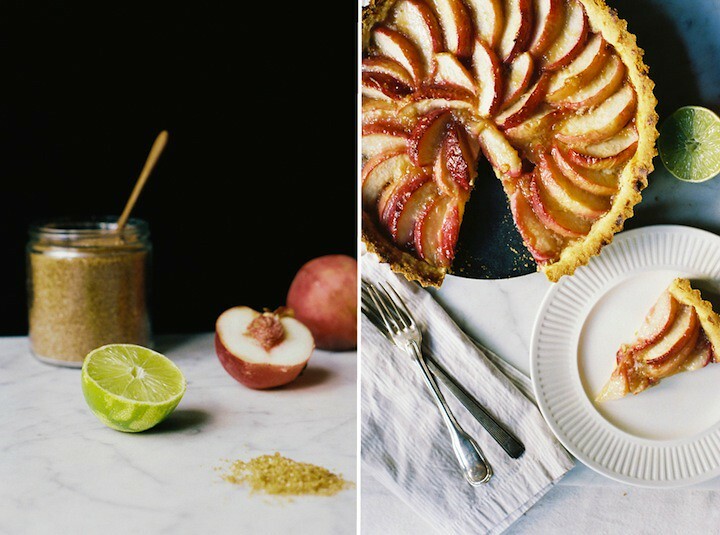 A perfect summer dessert should be easy to put together and it should definitely utilize and enhance the delicious fruit available this time of year. 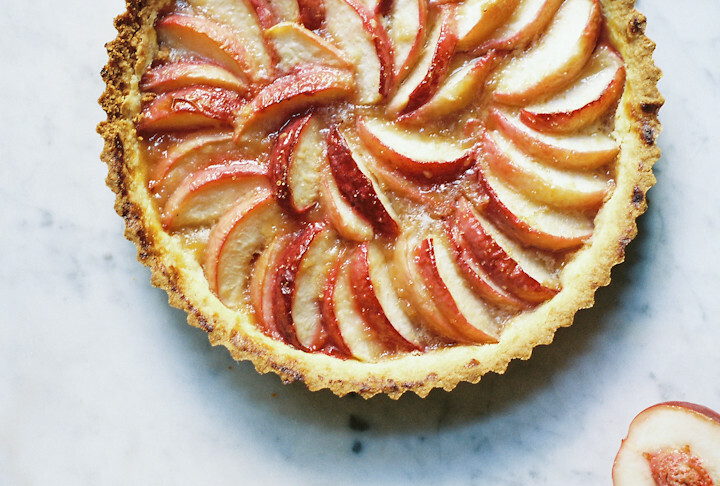 There are quite a few types of desserts that fit these requirements: crumbles, cobblers, and grunts for example, but sometimes I feel fancy and I want to make a tart. Something about lining a pan with fruit arranged in concentric circles just makes me feel elegant. What? Just me? Tarts can be really easy you guys, especially when you can just pat the crust into a pan (no rolling! and for the love of unicorns, no blind baking!) Then, all you have to do is slice up some of summer's sweetest, blushing white peaches (no peeling! ), toss them gently with a bit of ginger and lime for a punch of flavor, tuck them into your previously patted crust, and wait patiently. After a few minutes in a hot oven the peaches soften and release their juices, the corny crust crisps and browns, and it's done. 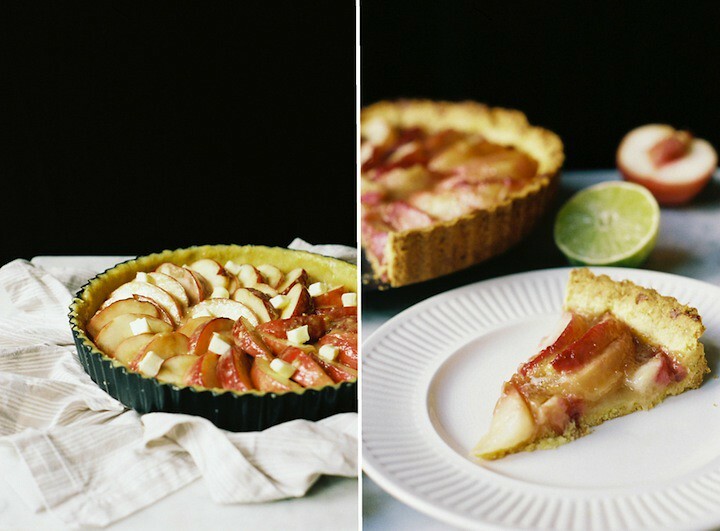 A perfect summer pair, all baked up in a fancy dessert that was a cinch to put together. Not that this even needs to be said, but the leftovers (if there are any) make a delicious breakfast. This makes a nice, thick crust (about 1/4'') which is my preference. If you prefer your crusts on the thin side, you may want to set aside a bit of the dough for another use before patting it into the pan. 1. In a medium bowl, stir the flours, sugar, salt and lime zest. Make a well in the center of the mixture and add in the olive oil, butter and egg yolk. Stir gently to combine. 2. Turn the dough out into a 10'' or 11'' removable bottom tart pan and pat it evenly on the bottom and up the sides. Refrigerate the shell while you prepare the filling. 1. Cut the peaches into wedges about 1/2'' thick (I cut my peaches into eighths). 2. In a medium bowl, whisk together the grated ginger, lime zest and juice, turbinado sugar and flour. Add the sliced peaches and toss gently to coat them in the mixture. 3. Arrange the peaches in tight concentric circles on top of the prepared shell, pour any juices left in the bowl on top, and dot the tart with the cold butter cubes. 4. 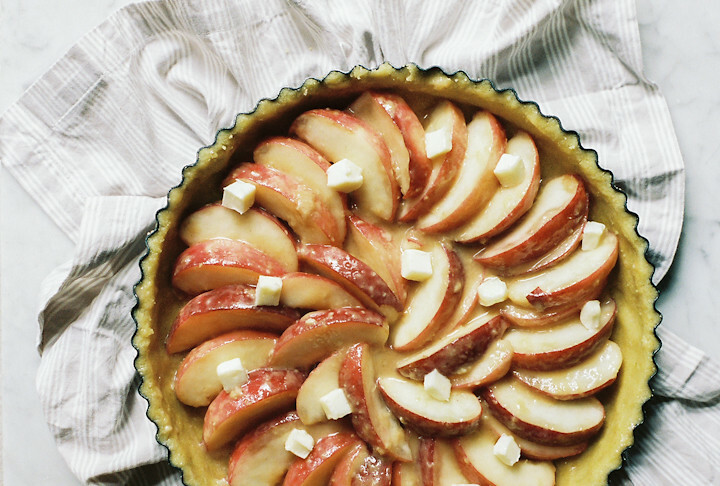 Slide the tart into the oven and bake until the peaches are soft and have released their juices and the crust is golden, about 30-40 minutes. Serve warm or room temperature with whipped cream, creme fraiche or a scoop of ice cream.